If we are truly honest, most of us don't really know what we're doing as parents. We have good intentions, but daily frustrations and ongoing struggles might be evidence that we were better prepared to drive a car or pursue our career than raise children. To counter the usual trial-and-error method of parenting, Jim Burns offers time-tested advice and strategies for today's busy families. Infused with his signature candidness and practicality, each chapter explores a different aspect of parenting--from breaking generational chains of dysfunction and creating a warm atmosphere at home to handling discipline issues and blessing your children with a legacy of faith. Helpful follow-up exercises and questions along the way reinforce the basics of good parenting and provide a foundation for developing your own family plan. You won't find any quick fixes here, but you will learn how to make a positive difference in your family. 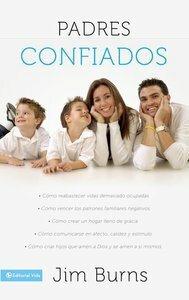 About "Padres Confiados (Confident Parenting)"
Jim Burns founded the ministry of HomeWord in 1985 with the goal of bringing help and hope to struggling families. As host of the radio broadcast, HomeWord with Jim Burns, which is heard daily by more than one million listeners, Jim's passion is to build God-honoring families through communicating practical truths that will enable adults and young people alike to live out their Christian faith. In addition to the radio program, Jim speaks to thousands around the world each year through seminars and conferences. He is an award-winning author, whose books include The 10 Building Blocks for a Happy Family and Devotions on the Run.